Societies are very welcome at Woolton with a wide variety of options available. The packages are available for groups of 12 or more and all represent excellent value. 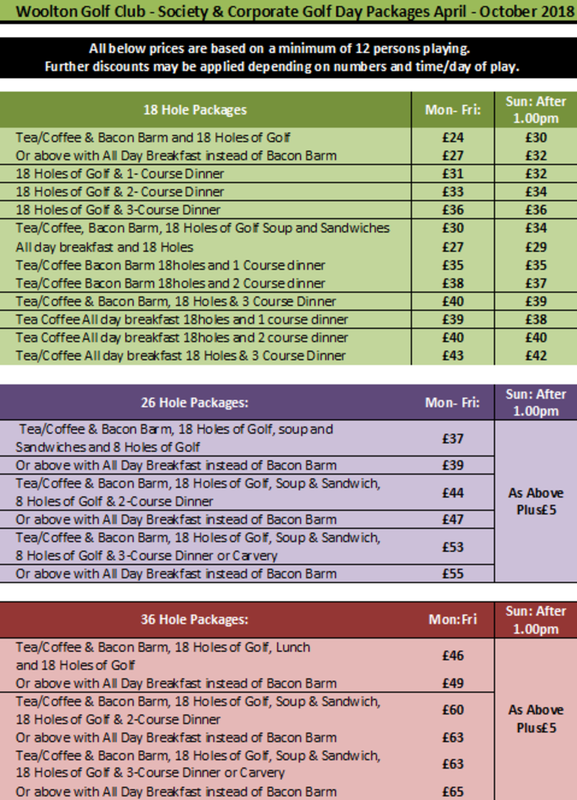 The packages allow for play of 18, 26 or 36 holes and a variety of different menus. If you are looking for a tailored package simply contact the Office. A date for a visit may be provisionally booked by contacting the Office by telephone but the booking will not be deemed to be confirmed until receipt of the completed booking form with all sections signed and accompanied by the required deposit. All bookings are subject to availability. All bookings are subject to a £100 deposit and numbers must be confirmed 48 hours prior to arrival otherwise a full charge will be made. The booking requests can be made by contacting the Office or alternatively by printing the PDF booking form (link below) and sending it to the Office, complete with the deposit.